It was a breathless day at Tynecastle. As Robbie Neilson spoke with the Evening News in the Tynecastle press room, Hearts owner Ann Budge walked past and joked with her head coach that many more matches like yesterday’s exhilarating victory over St Johnstone would swiftly turn her into an alcoholic. Neilson in turn mused that he was looking forward to heading home for a glass of red to unwind after being put through the wringer in a kamikaze encounter. Even by the standards of Tynecastle, a venue renowned for high drama, this was a truly intoxicating afternoon as Hearts announced their eagerly-awaited return to the Premiership, following a year’s absence, with a hard-fought triumph in a barmy match that left the 16,000 home supporters bounding out the stadium in a state of euphoria. Hearts included three of their five summer signings in the starting line-up, with Brazilian centre-back Igor Rossi surprisingly chosen at left-back ahead of Kevin McHattie. Blazej Augustyn and Juanma were the other two new faces in the side, with Gavin Reilly on the bench and Juwon Oshaniwa watching on from the stand as he waits to build up his fitness. Miguel Pallardo was the most notable absentee from the squad as he continues his recovery from an Achilles problem. There were four new recruits in the Saints line-up, including former Hibs captain Liam Craig and ex-Hearts pair Brad McKay and John Sutton. The Championship flag was raised by owner Ann Budge before kick-off, cranking up the sense of anticipation among an expectant home support. The sense of buoyancy inside the stadium increased further just four minutes in after unfortunate slip from McKay. The boyhood Hearts supporter had been relishing his first visit back to Tynecastle since joining the Perth side, but it all went horribly wrong when he lost his footing on the well-watered surface just outside his own box and allowed Juanma to burst clear on goal. The big Spaniard ran on to slot beyond the exposed Alan Mannus from 15 yards out for his first competitive goal for his new club. Despite this early setback, Saints were the better side for most of the first half. Tommy Wright’s side were unable to find a way back into the match while on top, however, and they were made to pay early in the second half as Hearts stepped things up a gear, in an attacking sense at least. After Juanma served further notice of his intent in the 48th minute when he swivelled in the box and drove a low angled shot inches wide of the far post from 15 yards, the Spaniard was instrumental in his side winning a penalty in the 52nd minute. The 24-year-old seized possession deep inside his own half, produced a magnificent touch to get himself away from a host of Saints players and surged into opposition territory. Although he had the opportunity to keep going himself, Juanma slipped the ball to his right into the path of Nicholson who burst into the box and was upended by Mannus as he tried to round him. The goalkeeper, who was cautioned, got up to save a meek penalty from Osman Sow, but Jamie Walker was sharpest on to the rebound and rammed the ball into the net from close range. St Johnstone grabbed themselves a lifeline in the 56th minute when Simon Lappin arrived at the far post to force home from a couple of yards out after Neil Alexander failed to deal with Joe Shaughnessy’s long throw into the box. Hearts were back in command in the 62nd minute when Walker, after darting in towards the edge of the Saints box, waited for support and slipped a lovely pass through to the marauding Paterson, who ran on to slot low past Mannus. Nicholson should have made it four when he nicked the ball off Tom Scobbie inside the box but rasped a powerful angled shot wide of the target from close range. “I miss a sitter like that in every game,” Nicholson joked afterwards. It almost proved costly, though, as St Johnstone came roaring back. Sutton marked his return to Tynecastle with a goal when he glanced in an inswinging delivery from David Wotherspoon in the 75th minute. Hearts were rattled and, just three minutes later, the visitors levelled when substitute Graham Cummins bundled in from close range after Scott Brown’s low drive from outside the box had ricocheted into his path. Saints certainly thought they’d done enough to take something from the match, with Craig in particular taking great delight in goading the Hearts fans in the main stand who had jeered his every touch. 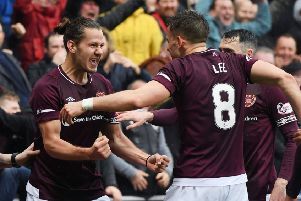 But just as they had done on the opening day of last season, when they recovered from conceding a late equaliser to beat Rangers 2-1 at Ibrox, Hearts roused themselves to eke out an unlikely victory. With ten minutes remaining and Saints seemingly in the ascendancy, Paterson, as he had done all afternoon, got himself up the right flank and delivered a perfect ball into the box for Nicholson, who only had to apply the finest of touches at the near post to help it beyond Mannus. Cue bedlam inside Tynecastle.